RadioShack (RSH) shouldn't be surprising anyone on the downside when it reports its quarterly results, but that's exactly what happened on Tuesday. Net sales fell 3% to $1 billion, weighed down by a 1.6% decline in same-store sales. Analysts were banking on a slight top-line uptick. Things only get worse from here, as gross margins were mauled as the company sold fewer post-paid wireless plans. The end result is that RadioShack's adjusted loss of $0.33 a share was more than double the size of the loss that Wall Street was forecasting. Despite all that, after the the market's initial reaction and sell-off, traders bid the stock back up to a recovery that saw it end Wednesday 10% higher than it began the week. The pros should be used to this by now. They were burned during each of this year's first two quarters. They were targeting modest profits, only to see RadioShack check in with red ink. They figured that they would stay a step ahead of the malaise by bracing for a deficit this time, but it turns out that they just weren't pessimistic enough. The decline in post-paid mobile -- a higher-margin category for the company than the cutthroat pre-paid market -- is a surprise. The smartphone revolution is booming, and RadioShack was supposed to be a major beneficiary of the transition. Unlike the dedicated carrier stores, RadioShack offers phones and contracts with all of the major carriers. It also teamed up with Leap Wireless' (LEAP) Cricket to launch its own line of contract-free wireless service. RadioShack stores are conveniently located in quiet suburban strip malls. It should be a compelling hassle-free option for folks seeking a little hands-on guidance in picking out their next phone. Well, folks just aren't going to RadioShack. It's been 10 months since RadioShack was the subject of my Why RadioShack Will Never Be Great Again article. The stock has gone on to shed more than 80% of its value. RadioShack is stressing its liquidity. Right now it has more than enough cash -- $938 million -- to cover its $749 million in debt. However, the retailer's model isn't going to be sustainable for long if it continues to post widening deficits. Even if RadioShack manages to squeeze out a small profit during the holiday quarter (given the seasonal push for smartphones), analysts don't see the company returning to profitability on an annual basis until 2014 at the earliest. Prospects for its small stores -- and its even smaller kiosks at cheap chic discounter Target (TGT) -- don't seem all that encouraging. 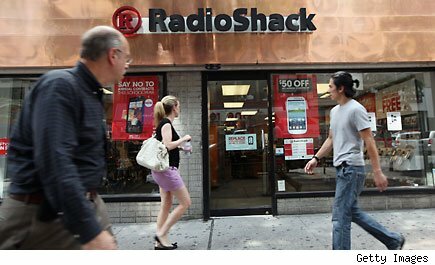 Given Wall Street's knack for understating the magnitude of RadioShack's problems, investors may want to stay away until the shrinking retailer stops calling the wrong number. Motley Fool contributor Rick Munarriz does not own shares in any of the stocks in this article. The Motley Fool has sold shares of RadioShack short.